Since ancient times, Egypt has had a complex relationship with its snakes. Several snake species inhabit Egypt’s borders, and while most are harmless and even beneficial, preying on rodents and other pests, some, like the cobra and the horned viper, are deadly. This love-hate relationship with snakes is reflected in ancient Egyptian mythology, with snakes representing both evil demons, such as the chaotic snake god Apophis, and benevolent gods such as the fertility goddess Renenutet, who was often depicted in the form of a cobra. If there’s one snake in all of Egypt most likely to be mistaken for a devil, it’s the horned viper. This highly venomous desert snake has a hornlike scale protruding above each of its eyes, giving it a truly demonic appearance. This species is relatively short compared to other snakes in the region, ranging from approximately 1 to 2 feet long, with adult females being on the larger side. The horned viper has a broad, flat, triangle-shaped head with eyes on the sides. The broad semi-flattened body is covered by 25 to 30 rows of thick, heavy scales that are brownish-yellow to gray in color, providing perfect camouflage for the sandy desert environment in which it lives. The Egyptian cobra is another of Egypt’s most deadly snakes. It’s also one of the largest cobra species in all of Africa, ranging from 3 to 6 1/2 feet long. 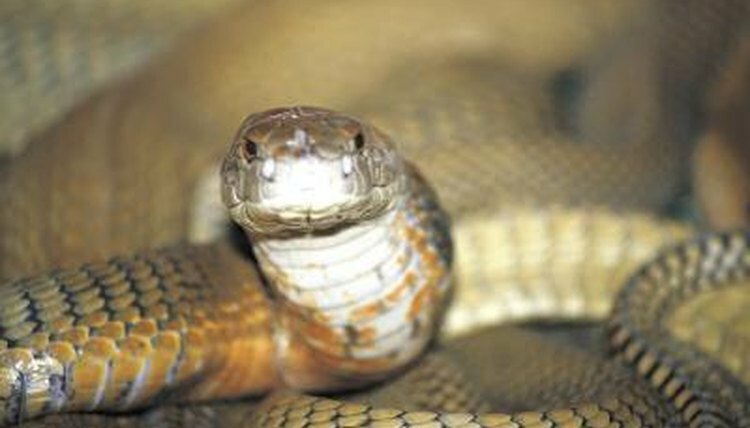 The telltale hood associated with this species is extended only when the snake is threatened or annoyed, at which point its spread reaches about half a foot wide. This snake has a broad head and snout and large round eyes. It has smooth scales that vary in color and pattern, ranging anywhere from pale cream or yellow to brown to copper to black. The African egg-eating snake is one of Egypt’s more benevolent species. These tree-dwelling snakes have a wide range throughout Africa and parts of Arabia, but in Egypt they primarily inhabit the southern Nile Valley. This nonvenomous snake is unique for being adapted to survive solely on bird eggs, and is able to fast for long periods between bird nesting seasons. In addition to small teeth and a mouth that can distend wide enough to swallow a whole chicken egg, it also has specialized neck vertebrae for breaking the eggs, after which the snake swallows the contents and regurgitates the shell. This desert boa constrictor is on the small side for constrictor species, reaching only about 2 to 3 feet long, but it’s an excellent rodent hunter, which makes it a well-loved snake. This species is also popular with snake hobbyists and breeders, with a docile nature that makes it a good pet. Sand boas have small heads with small eyes, muscular bodies and short tails. Wild specimens are usually orange or yellow in color, with dark brown splotches and a white or cream-colored belly. However, domestic breeding of these snakes has resulted in a wide range of more unusual colors and patterns, including black-and-white patterns and several varieties of albinism.